I'm back in Cincinnati for the holidays, visiting my family. I haven't lived in Cincinnati for about four years, and back then I was only just getting into knitting - so, I've only visited just a couple of the Cincinnati LYSes, of which there are quite a few. My sister told me that she passes a yarn shop on her way to work every day - Hank in Hyde Park. I hadn't heard of Hank before, but it's easy to find on Observatory Avenue, right on the street. The shop is spacious and well laid-out, with a nice selection of buttons, needles & notions, and of course all the yarn. 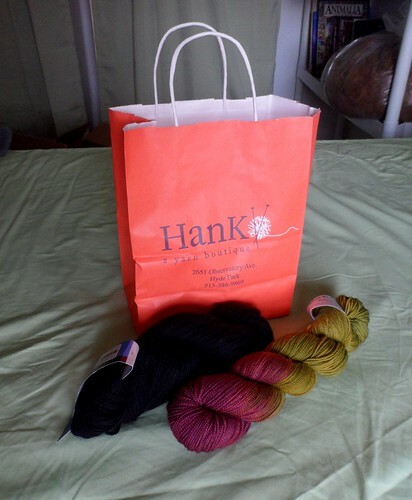 Hank Yarn has a nice selection of medium & heavy weight yarns, a fair selection of sock yarn but not much lace. Of course, for a souvenir skein, I made a beeline to the sock yarn section. They have some delicious Malabrigo sock and Claudia, but a yarn that I wasn't familiar with caught my eye - Blue Ridge Yarns Kaleidoscope in Boysenberry. I am absolutely in love with this color combination. It reminds me of a dark pink rose. I simply couldn't resist it.